Mom and I used to take road trips all the time. That is, we traveled to visit her mother, my grandmother, by road. We were always on a timeline to get to grandma’s house and our return trip was much the same. Even still, we had a good time traveling the roads of America. We decided this road trip would be different. We didn’t have to be anywhere by a specific time. We didn’t even plan hotel rooms along the way. We just wanted to hit the open road and let it take us wherever it will. Our only restraint was we had to be back by 7:30 AM on Monday. Day one begins with me at the rental car agency. When I arrived to pick up my car, I was pleasantly surprised to be given a bigger car for the same price as the smaller one I reserved. I drove out of the parking lot and made my way to Mom’s. We were ready for our adventure to begin! It wasn’t long before we had to make our first pit stop. The car was doing great on fuel, but we needed to get out and stretch. I began looking for a suitable place to pull over. I spot a gas station with a fast food establishment attached and proceed to exit the highway. We pulled in the lot but once we got closer, we couldn’t help noticing how deserted it appeared. It was obviously open, but it exuded a certain stop-here-if-you-want-to-be-kidnapped-and-murdered vibe. We continued around the building and jumped back on the highway in search of somewhere a little less scary. We found it a few exits away. We loaded up on coffee and snacks and made our way back to the highway. It won’t be long before we abandon the highway for a while to check out what the state has to offer. Who knew that while traveling a little piece of the country that we would visit so many exotic places? We drove through towns named Mexico, Cuba, New London, and Louisiana. Traveling through these towns reminds me of our global connections. It seems we might be worlds apart, but we are more alike than we think. I wanted to visit Hannibal, the boyhood home of Mark Twain, a.k.a. Samuel Clemens. It was one of two cities we planned to visit along the way. We arrived to town and drove around until we found Main Street and the Mark Twain Museum and Boyhood Home. We parked our car and went inside to find that tours included several buildings so we purchased tickets and started on our way. 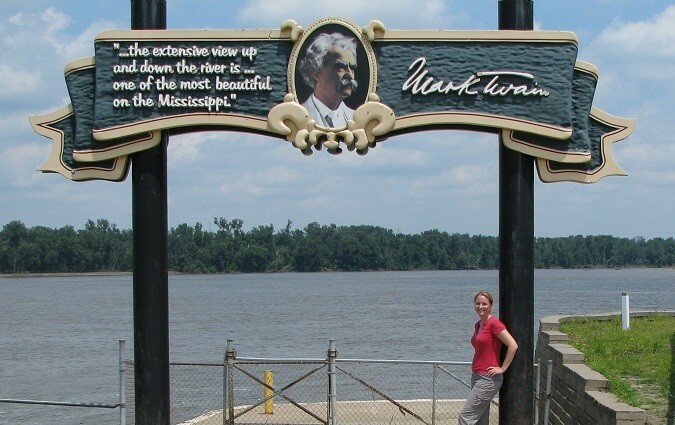 The tour was nice and a must see in the city where Mark Twain lived, but my favorite part of our visit to Hannibal was walking along the Mississippi river. It was a hot Midwestern day and the breeze off the river offered some relief, though that was only an added benefit of walking the banks of the Big Muddy. Mom and I drove over the Mississippi every time we visited my grandmother. Standing at the bank with her was a welcome change and an added perspective. Driving over the river doesn’t allow you to fully appreciate its size or beauty. While on our stroll one of the many trains that run along the tracks by the river made an appearance. I rushed my mom back to the tracks so we could see the train close up while it sped by. After the train made its way past us, we crossed the tracks to head back to Main Street in search of food. After eating at a cute little coffee shop and meandering along Main Street for as long as the heat permitted, we got back into our rented car and headed toward our next planned destination. We planned to drive the scenic route south to St. Charles. We hoped we would get to drive along the river, but that was not the case. Instead we traveled through large hills surrounded by trees and cliffs. With only a few chances to leave the scenic route, mostly to stop and appreciate the gorgeous vistas, good planning is necessary. Prepare to not stop for at least an hour. We had a very specific destination in mind for St. Charles, but upon arrival, we discovered a place I wasn’t expecting. A suburb of St. Louis, St. Charles offers the charms of a village with cute shops and beautiful walkways along Historic Main Street. Because we had a short time for our trip and we arrived in town late in the day, we had to prioritize. We could spend extra time in St. Charles or we could continue traveling the open road. We selected the road, but I decided I would be back to explore this area along the with Katy Trail just about a block from Main Street. Both on the banks of the Mississippi. In the space of one day, I fell in love with the waters of this magnificent river. We did not want to be confined to a timeline on this road trip, so we had no plans on where to stay. We drove around, tired from all the walking and heat of the day to find a place to spend the night. Luckily, when we stopped at the first hotel they told us they had two rooms available and we got one. We found our room and saw the clean soft beds waiting for us. We were both exhausted and the room was cool and welcoming. It was still a tad early to go to bed, at least for me, but it wasn’t long before I was asleep. Stay tuned for part two of Weekend Road Trip! In the meantime, please share your favorite weekend road trip destinations in the comments below. I love that you found $2 in the casino restroom!! Too funny! My fav destination is Estes Park, Colorado. Love it there, but it’s a long drive! Thank you for taking the time to read this post, Michele. Estes Park is on my list to visit very soon!